These last couple of weeks have been all about glass. Bubbles and glass. I’ve had a show at UCL, London (www.pattern-completion.net) so haven’t had so much time to spend on my Garden project. But I’m happy to be back in my workroom today, with plenty of reading, writing, scanning, thinking and projecting to do. I went to the BFI on Wednesday to watch František Vláčil’s short film Glass Skies. I discovered Vláčil’s work only recently, but was struck by his poetic approach to filmmaking. This piece tells the story of a boy’s fascination with the sky. We see him playing in his grandfather’s greenhouse, a model bird he sends soaring over the glass roofs breaking one of the panes. The boy runs away from the garden, to discover an airplane parked in a nearby field. He climbs into the cockpit and imagines taking off.  Throughout the film, characters and objects are viewed through panes of glass, as reflections in mirrors or distortions in shiny aircraft-parts. Obscured-glass panels of the greenhouse transform figures into abstract blocks of colour; raindrops falling onto clear glass panes blot out the scene beyond; pools of water in the garden create rippling images and reflections. On one level a poetic reverie on flight and light, the film has ominous overtones – the story implies a plane crash involving the boy’s father. The microcosm of the greenhouse, presented as an unreal place of mirage and magic, echoes the dangers of the outside/real world beyond. Again, I’m reminded of the idea of the garden as a microcosm; and of the relationship between gardens, childhood and play. I went to Nettie Horn this week to see Sinter Werner’s latest show, Along the Sight Lines. I’ve been following Werner’s practice for a while now; she makes site-specific installations, collages, large-format slides and photo prints that explore the unstable, illusory experience of perception. Standing in front of her pieces feels a bit like looking through one eye and then the other and seeing the scene in front of you jump. My favourite piece in this show was a photo-collage, Milos IV (2010): Two black and white photographs showing a gnarly island rock are layered one on top of the other and box-framed. Following the lines of the rock’s nooks and crannies, Werner has carefully cut small shapes from the top layer to reveal the second image underneath, which is slightly out of focus. It is a subtle intervention, but enough to recall something of a 3D experience – that of peering through the holes and cavities in an actual rock face to the mysterious (fuzzy) darkness within. It’s interesting that, while the differently focused layers do create a kind of illusion of depth, the collage calls more attention to the very flatness of the photographs, and the dimensionality/physicality that they lack. In the same conversation, she references Foucault’s 1967 lecture ‘Different Spaces’ and his idea of ‘heterotopias’ – alternative spaces that bring together within one actual place, various relations of proximity (emplacements) that seem incompatible in themselves. Like theatre and cinema auditoria, and like gardens. 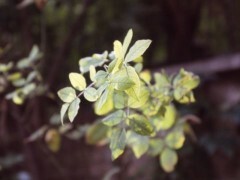 I remember that Peter Ainsworth described his father’s garden as a stage for his photography. 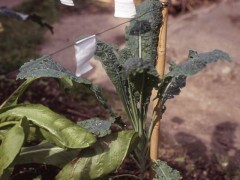 It is interesting that some of my newest slides have come back looking rather like an animation set – the lines of white paper flags demarcating the vegetable patch resemble miniature strings of bunting, and set up a curious sense of scale against the shoots and leaves. I spent an evening with my slide projectors this week, combining frames from my June/July shoots to create double exposure effects. Turning one bulb on and then the another, I thought about the differences between single and overlaid compositions, the way the quiet portraits of the individual shots are transformed into kind of noisy, more complicated images when a new layer is added. Where two slides overlap and combine, new forms are suggested and new associations are formed. There is a sense of ambiguity and changefulness in the composite image, a hint of movement almost. I love that film projections are not quite static, that they have a fragile, hovering quality: they can and might disappear at any moment. These double-images seem to heighten that sense of suspension, they are in-between two moments, an amalgam, a fiction. While I have tried to combine the two layers subtly, masking out sections of one or other frame so that the double-image is not overpowering, there is still a sense of disjunction and a knowledge that the scenes have been assembled, constructed. I went to Culpeper on Saturday morning, a nice time to visit as there weren’t many people around. After all the rain the garden was looking lush and green. 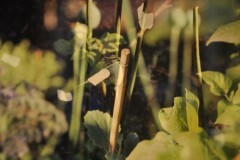 I took a couple of rolls of slide film, focussing on a carefully planted vegetable patch, whose rows of what I think are onions and kale are framed by strings of white paper markers. I also shot about 30 feet of super 8 film. Inspired by the idea of the seasonal exchange between garden and city, one potentially giving way to the other as the environmental conditions change, I’ve started looking at the buildings that surround the garden walls. At the moment the foliage is dense, and the houses, windows, architectural details are just snippets glimpsed (or glimpsing) through the green. But as the winter draws on and the leaves fall, I imagine the city will become much more visible, more present in the space. The camera, a Canon AZ 814, was given to me by my mum’s ex-boyfriend, who used it when he was an art student in the 80’s. I’ve only used it in two or three projects, and am still a bit tentative handling it. But it is such a pleasure to hear it ticking away, to watch the counter turn; the stock feels quite precious and I enjoy the nervous excitement of not knowing how and if it will have come out. The eyepiece and viewfinder seem very small compared to my SLR and my digital cameras, and I really have to squint hard to get the focus right. 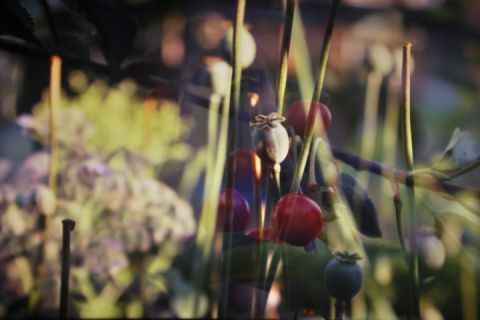 The lens transforms the colours and texture of the garden around me – the prism-screen shading the scene in a kind of grainy-grey, parts of the frame given a kind of reddish tint where, I guess, the lens has aged. As I peer down into the body of the camera, the scene already feels quite ‘other’ to the actual landscape in front of me, it is framed, extracted and transformed. While on holiday in Portugal last week, my boyfriend and I found ourselves seeking shelter from the baking heat and bustling crowds in Porto’s Crystal Palace Gardens. The sense of relief was immediate as we passed through the gates into the cool shade of the trees, as we walked alongside calming fountains and carefully laid flowerbeds. I thought about this impulse to escape the noise, confusion and tarmac-heat of the city. And how ‘natural’ spaces are invariably introduced to city plans as if to provide a respite from work/life/society. I think back to my slides – the ‘framed space’ of Culpeper being re-framed by the camera lens; close-up and time-lapse shots revealing a ‘different nature’ from an already ‘unnatural’ space. I plan to shoot another roll on Friday, rain or no rain! Today I went to the Stephen Friedman Gallery to see work by the four artists shortlisted for the Dazed & Confused Emerging Artists Award – one of whom is Laura Buckley. Buckley is showing a new installation, KZN, in which a video loop is projected through a suspended and rotating hexagonal prism. As it spins, the prism reflects fragments of the video image around the room while at the same time casting a heavy geometric shadow over the main projection image. 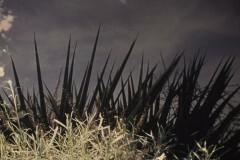 The video appears to be shot on a hand-held camera as the artist walks through domestic gardens and industrial landscapes. She explores patterns of light and shade in tree canopies and on tarmac pathways. Obscured glass windows abstract objects into hazy, honey-coloured shapes. The picture is constantly being redefined, cut-up, repeated and eclipsed by the Perspex prism, which has quite a weighty presence in the gallery space. No attempt is made to hide the apparatus of Buckley’s experiment (the huge installation projector, the large wooden plinth, the chunky speaker), rather our attention seems deliberately drawn to it, to her process of investigation and play. Snippets of children’s voices filter through the electronic sounds from the speaker; a child’s hand appears in the video to spin a metal object for the camera. Full of primary colours and dancing shapes, the work is like an exploded computer game, a digital mobile. Secondary reflections and refractions bounce off the hanging prism and travel around the room. I’m reminded of Peter Campus’s closed circuit camera installations. But unlike Campus’s works, interaction with the apparatus is not invited. In fact it wasn’t easy to approach the prism at all, the light was blindingly bright. Better I found to sit down on the floor and look up, as if from a child’s perspective in fact, at the kaleidoscope above and around me. “With an increasingly concentrated urban population, many people have become more distanced from nature, and a private garden space is an ever more precious asset. The idea of the garden remains strong in the popular consciousness, but for many it is precisely this – an idea. The garden’s metaphorical associations grow more ambiguous and more extreme. For many contemporary artists it is still a site for reverie and imaginative potential, but it also stands for a lost world, a place that is neglected, interfered with and under threat. This evening I did some projection tests with a few mounted slides. As soon as I switched the projectors on, the difference between the film images and my digitized scans became hugely apparent – the colours have that lovely, warm tint that had been ‘corrected’ by the computer, the picture is speckled by dust and hairs caught on the lens, textures of the wall merge with and become part of the photograph. And that amazing moment when the projector is turned on or off, the image slowly emerging or dissolving away into nothing.